When Jenny (16) comes home from a concert and tells her parents she's tripping on acid, the hallucinogenic parental meltdown unravels the family dynamic as Jenny discovers the power of rebellion. What is supposed to be an educational and collaborative weekend professional development session for the English Department of Prescott High School instead turns into a blood soaked nightmare when a masked killer targets them. Molly: Let's get this killer night started! 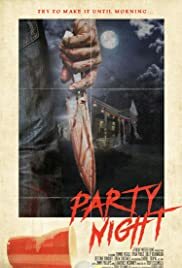 Yet another film that wants to imitate the slasher of the 80's. Why do this?? Why not just get a slasher from the 80's?!! It is so rare that these "Neo Retro" films actually work, but hipster directors still churn them out. So we have a bunch of kids who skip the prom after-party and go to a secluded cabin instead, where they all end up being slaughtered (even the kills are totally unimaginative!) The film sounds as if it was recorded in someone's bathroom. You are never told who the killer is or why he is killing. Most of the film is just terrible acting and drinking beer. The critics praised the acting of the "final girl", but I've seen sheep act more convincingly! The only thing at all decent about this movie is the great retro poster art.